One of the most common public misconceptions about interpersonal violence involves its presumed random and idiosyncratic character. These perceptions are in sharp contrast to a large and growing body of empirical research that reveals strong and consistent patterns in the offender, victim, and situational factors that underlie violence in a variety of different contexts. Regardless of its expression in criminal behavior, sporting events, street-level encounters or in the privacy of domestic relations, interpersonal violence is incredibly structured and patterned in terms of the characteristics of its combatants, its predisposing and precipitating conditions, and the action sequences that underlie the escalation and de-escalation of these violent encounters. While some aggressive situations lead to physical assaults and have lethal consequences, the structured nature of interpersonal violence is also indicated by the fact that the vast majority of these encounters are terminated without physical injury to the participants. 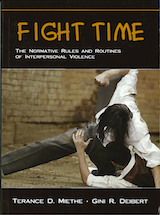 The primary goal of this book is to describe the normative rules and routines that pattern the nature and consequences of acts of interpersonal violence. After describing these rules of engagement surrounding aggressive situations, we explore some of the interpersonal and situational factors that facilitate and inhibit the escalation of violence in these situations. IMPORTANT: The e-Book that will be downloaded to your computer, following its purchase, is a compressed file (.zip) and must be decompressed prior to use. Most computers can decompress files automatically by double-clicking the compressed (.zip) file once download is complete. In many cases, a compressed file will decompress (i.e., unzip) automatically upon download. If you experience any problems accessing materials you have purchased, please contact us immediately.